At first when creating Today we answer the question: Tomatoes: Salad PARTer or Conversation stARTer?, which later also took the twitter title, Tomato story-time with @SnoopDogg and other featured word players, I was thinking I would provide some tomato context as part of it: Garden tomatoes picked before the last frost. 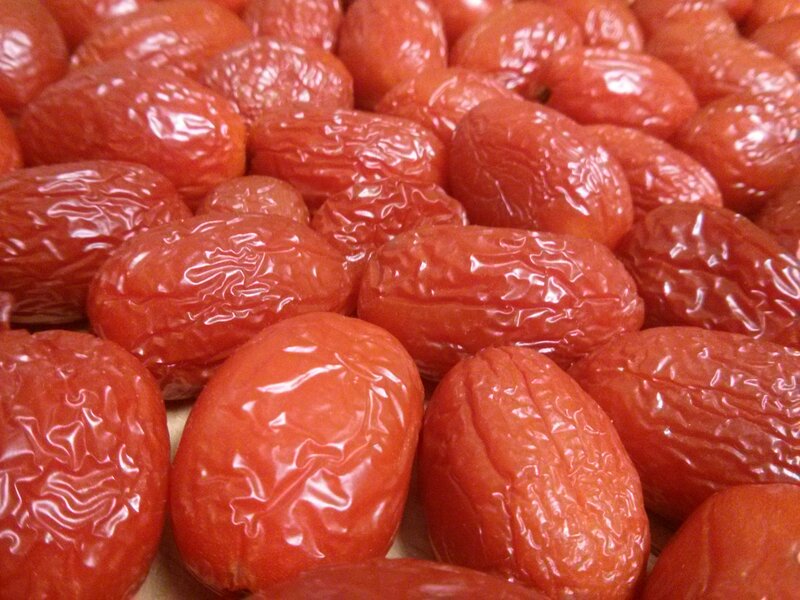 Left to sit on the table as they ripened. Two months pass. Two thirds remain. Wrinkled prunes on fire. Ready. Waiting. To tell their story. One word, next word, next word, Go! The story and art were good on their own though, so to this next post the artist’s statement did go. 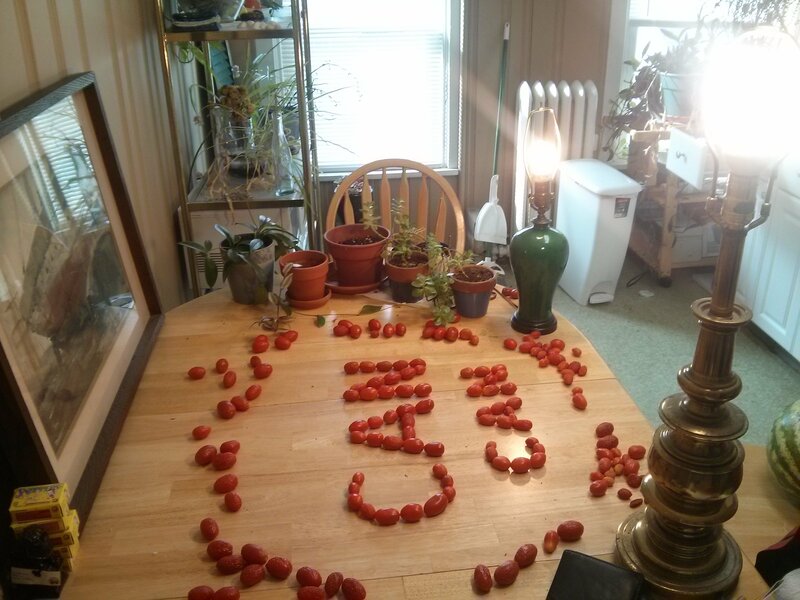 Plus, there’s a selection of tomato photo shoot outtakes. Yes, here we are now, behind the scenes. Some of you may remember how my table looked two months ago after the final garden harvest. Then from October to December, we went from green to red, and six plates to four. 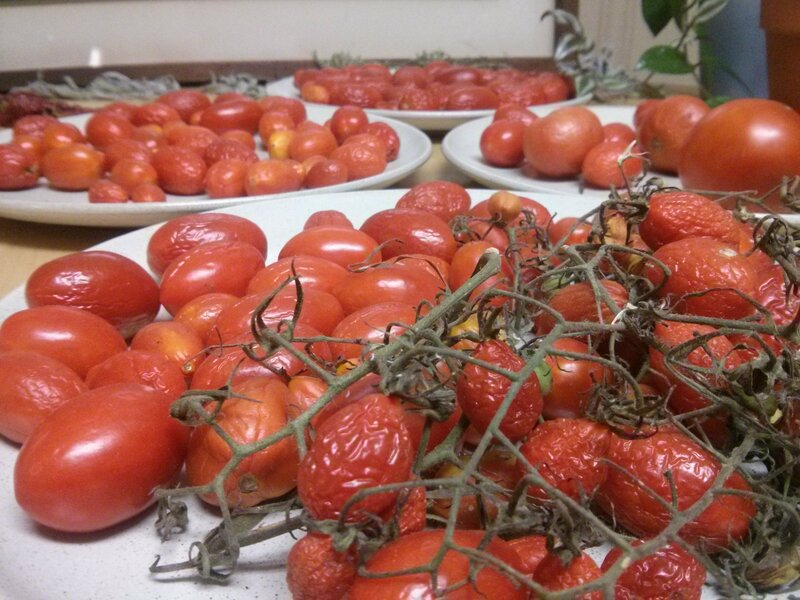 The amazing thing is how all the tomatoes turned red! I did have to toss a few along the way, but that was to be expected, and beside the point. 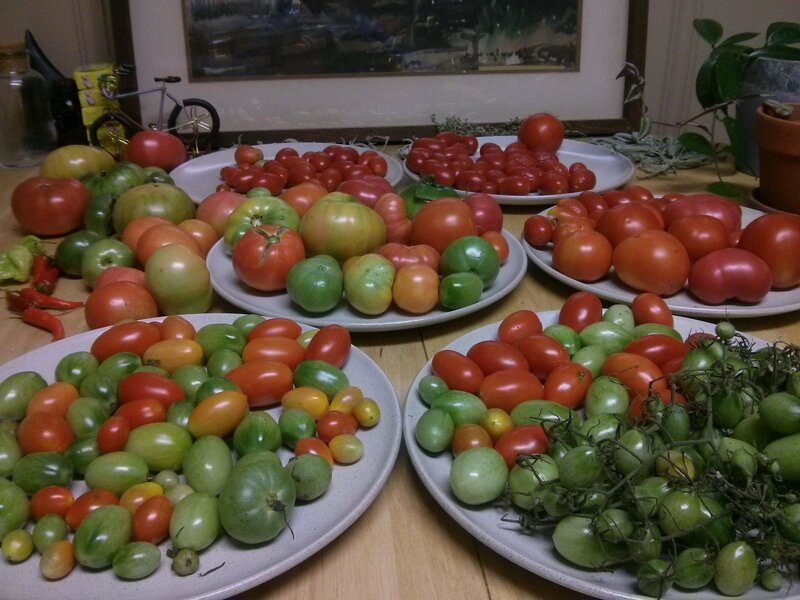 Per past farmer advice and personal experience, a tomato, picked green, does not ripen. “As long as it has a little color, even the tiniest bit, it’ll turn red, but if it’s all green, it’ll stay green.” Apparently my table, the air in my kitchen, the soil in my garden, and/or the tomatoes’ latent lycopene desire to talk and tell stories won out. Some type of tomato magic you might say. Some internet research now also tells me that green tomatoes, particularly those of a more mature size, do have the potential to ripen. But nonetheless, little green grape and paste tomatoes, turning red! Perhaps they were waiting for the big stage. Or hoping to impress some raisins. Or looking to take a ridic rhyme time pic. 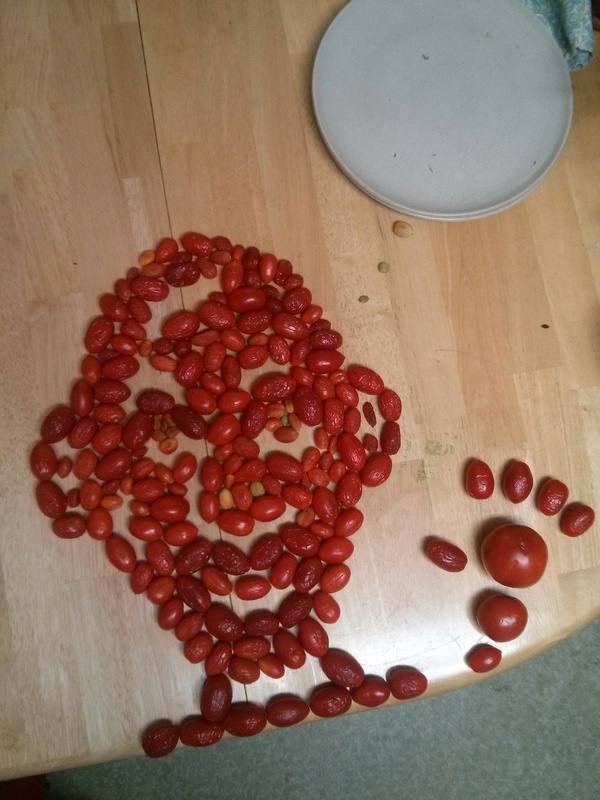 In any case, the tomato party continues. Initially I had been thinking that once the story was over, I’d come up with a good tomato recipe and use the tomatoes in it. Now I think they’ll keep me company for a while longer. What happens when you use every single remaining tomato. Hey, how’s it going? Good to see you. 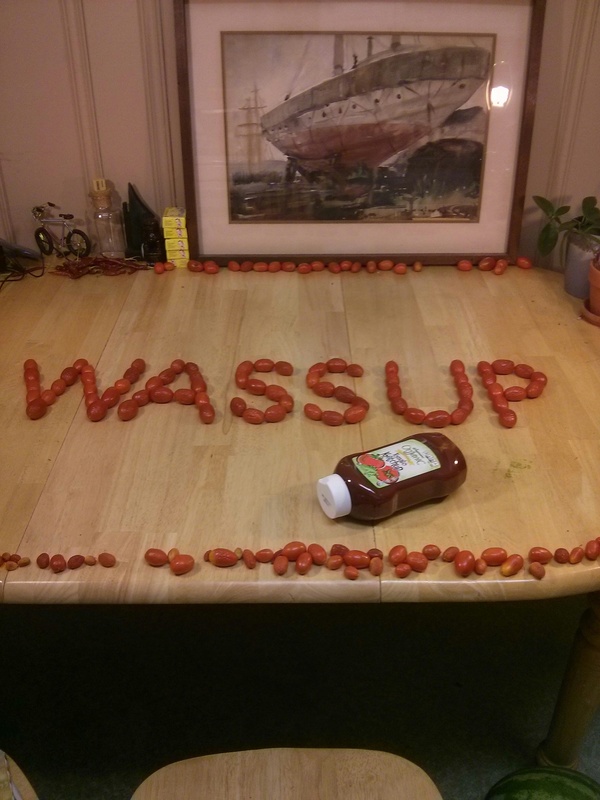 This entry was posted in Uncategorized and tagged art, cartoon, catsup, food, ketchup, photo shoot, story, tomatoes, wassup, you write the caption on December 17, 2015 by dave379.